Stuffed Pork Chops are always a treat! 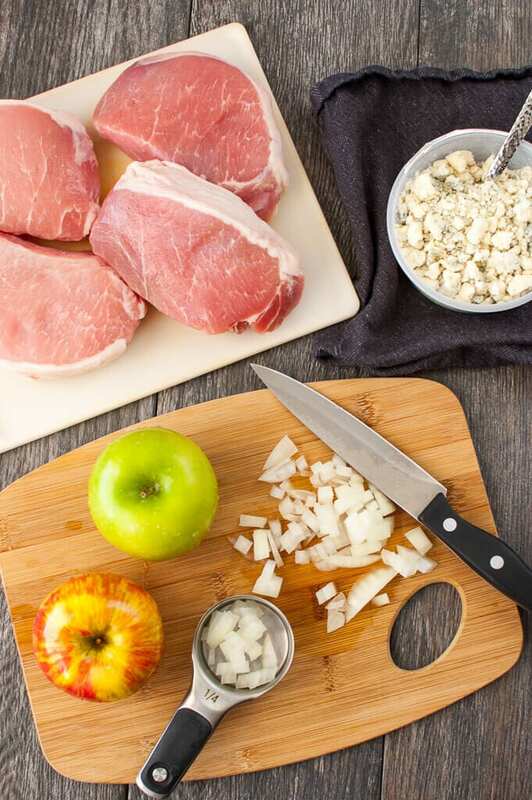 Shake up your standard recipe with these Slow Cooker Apple Stuffed Pork Chops. This will quickly be your go-to dinner on busy nights or weekends, so simple and easy not to mention delicious too! When you think about a typical week night dinner for many families, its probably a safe bet many of us think about pork chops! I mean, they are pretty simple and most people like them. They are also easy and quick to make. 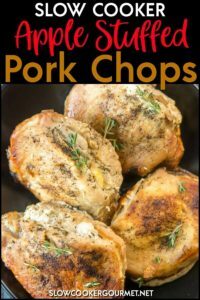 I love creating pork chop recipes because they make my kids happy! The only downside is that sometimes they can get a little boring if made them the same way every time. Regardless of how your chops are cooked (pan fried, baked or grilled) it is always good to mix things up! 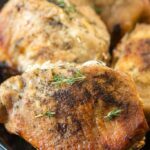 What if I told you that making stuffed pork chops wasn’t much more work and, with your slow cooker, it would actually be really easy to get these chops on the table even on a weeknight? You are going to love these Slow Cooker Apple Stuffed Pork Chops! One of the many things that makes this recipe so attractive is it only uses 6 ingredients plus salt and pepper. Many of these ingredients you probably already have as a staple in your pantry. It is possible to have a great dinner and not have to purchase a crazy amount of ingredients, or a ton of prep work. 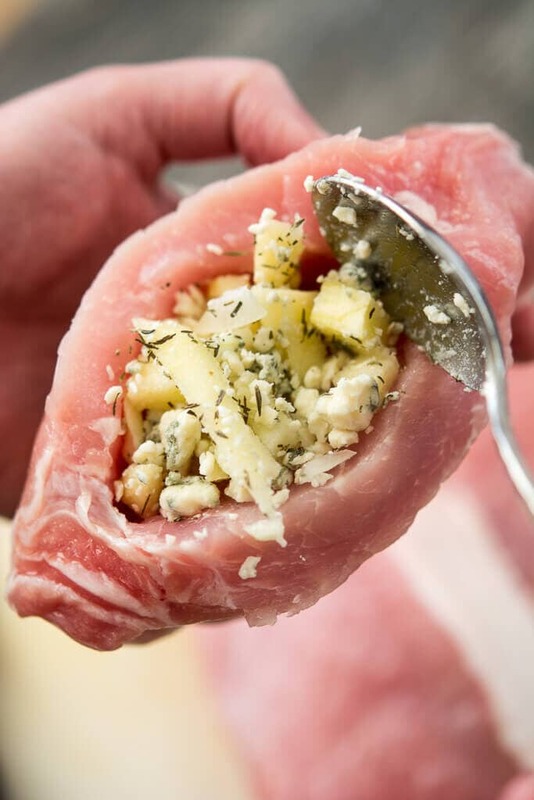 Simply dice up some apple and onion and combine with crumbled gorgonzola cheese. You are already half way there! The key to stuffing pork chops is to make sure you get thick ones! 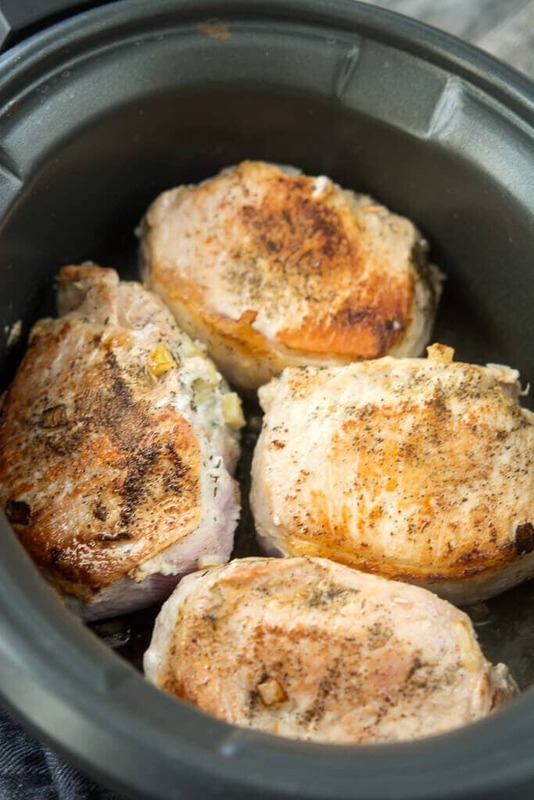 Many people are nervous about using thick pork chops because of not being able to cook them evenly, but your slow cooker makes that cooking process so much easier! You will simply use a very sharp knife to cut a ‘pocket’ into each side of the chop, making it as big as you can without cutting all the way through. No need for fancy kitchen gadgets just use your fingers to really push the stuffing in, you will be surprised how much you can fit. Lastly, use a toothpick to secure them shut, just don’t forget to remove before serving! Season the outside with a little salt, pepper and dried thyme and sauté in a little butter, searing on each side for a couple of minutes until browned. Transfer these beautiful pork chops to your slow cooker and let them slow cook on low for 6-8 hours or high for 3-4 hours until an internal temperature of 165 degrees is reached. There is something very fulfilling about sitting down at the end of the day to a delicious and healthy dinner your whole crew will love! 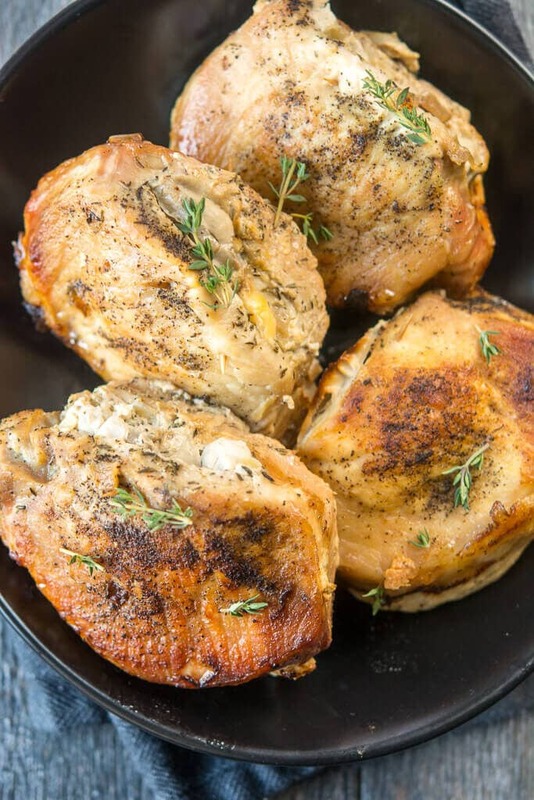 These stuffed pork chops are sure to be family favorite! Pork chops can be so versatile and it is really fun to mix it up! 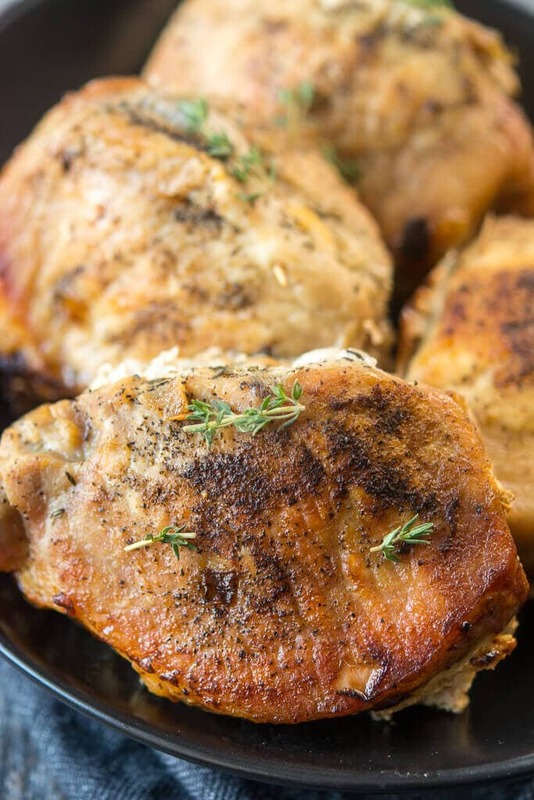 If you liked these Stuffed Pork Chops, check out some of my other tasty recipes! This looks delish but I dislike blue cheese and similar strong stinky cheeses. What would be a good substitute? You could try goat cheese. Let me know how it turns out, Brittany! I just did it with goat cheese and it turned out awesome. Any specific broth, or liquid to slow cook the chops in? Nope, we don’t really add liquid in this recipe, although you could add 1/4 cup water if you are worried that your chops will be too dry. Why is it the ingredient list says blue cheese crumbles and the directions say gorgonzola cheese? Which one or are they the same thing or can be substituted? Hi Mary! Sorry about that, yes, Gorgonzola is a type of blue cheese and happens to be what I used for the recipe. However, I didn’t mean to use it interchangeably in the recipe, so I will go back and fix that so it’s not confusing. Thanks for letting me know about it and be sure to let me know how the recipe turns out for you.